The Nobel Laureate and former Chief Economist of the World Bank Joseph Stiglitz wrote a review of The Shock Doctrine for The New York Times calling the parallel between economic shock therapy and the psychological experiments conducted by Ewen Cameron "overdramatic and unconvincing" and claiming that "Klein is not an academic and cannot be judged as one. There are many places in her book where she oversimplifies." He also said "the case against these policies is even stronger than the one Klein makes" and that the book contains "a rich description of the political machinations required to force unsavory economic policies on resisting countries." 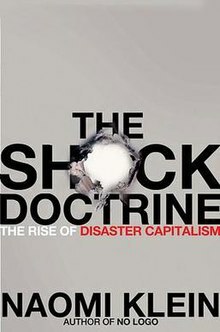 Shashi Tharoor in The Washington Post says that The Shock Doctrine takes Klein's criticism of capitalism an important step further. He also said Klein "is too ready to see conspiracies where others might discern little more than the all-too-human pattern of chaos and confusion, good intentions and greed". This page was last edited on 15 April 2019, at 01:08 (UTC).